I have been a college teacher and a journalist. As a freelance content writer, I research the subject to write without prejudice and malice. 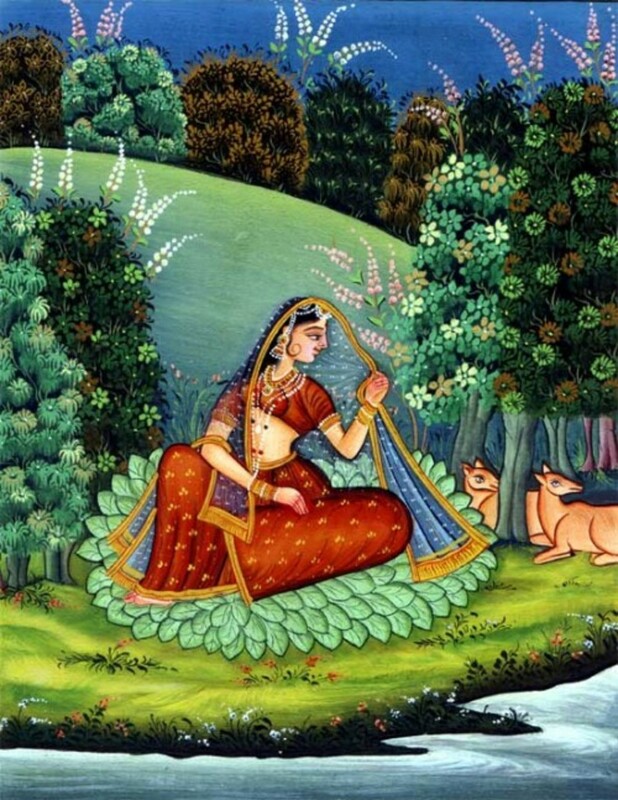 The miniature paintings of erstwhile states of Punjab Hills in India are known as Pahari painting. The word Pahari means hilly in the local dialect. 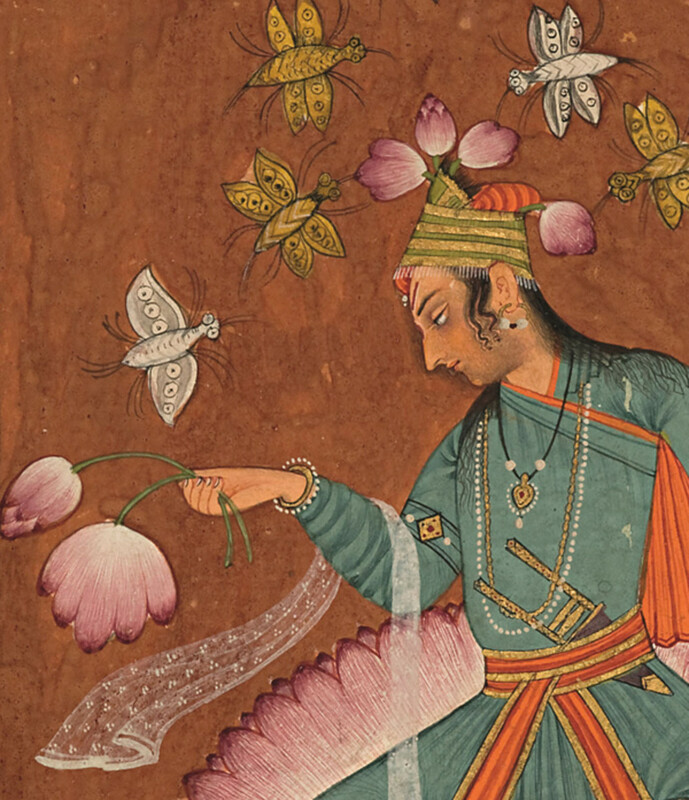 These paintings began under the Mughal influence during the reign of Aurangzeb. They also bear the impact of the paintings of Nepal, Kashmir, and Rajasthan etc. 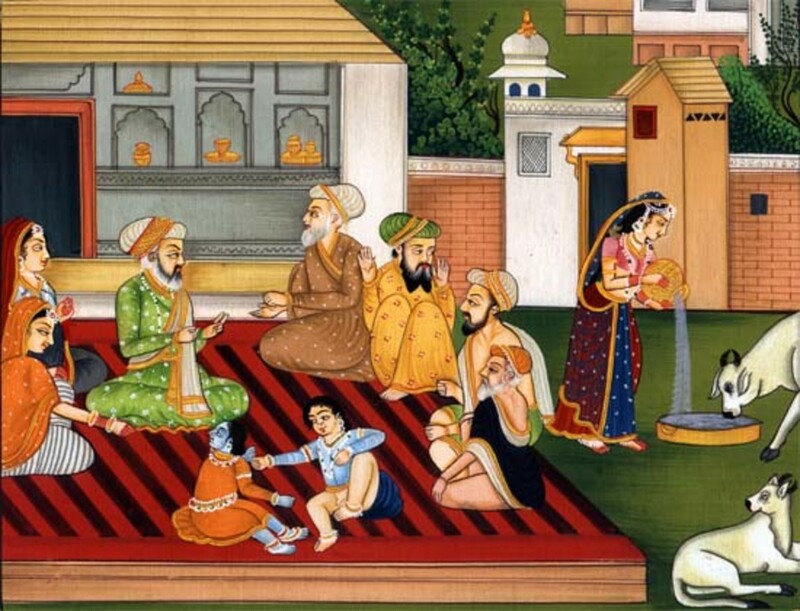 The Pahari School of Miniature Paintings consists of the works of a large number of talented artists who contributed to developing this unique style of painting. It was the outcome of family tradition and the centuries of hard work. Most of the paintings were destroyed in natural calamities, wars, fire etc. The leftover is not very enlightening, though a few contain the name of their creators. But the rest could be guessed by the art historians on the basis of style and nature of work. The Pahari paintings have different schools or styles because they had several patrons like the rulers of Basohli, Guler, Kangra, Chamba, Tehri - Garhwal, Nurpur, Mankot, Mandi, Kullu, Bilaspur etc. 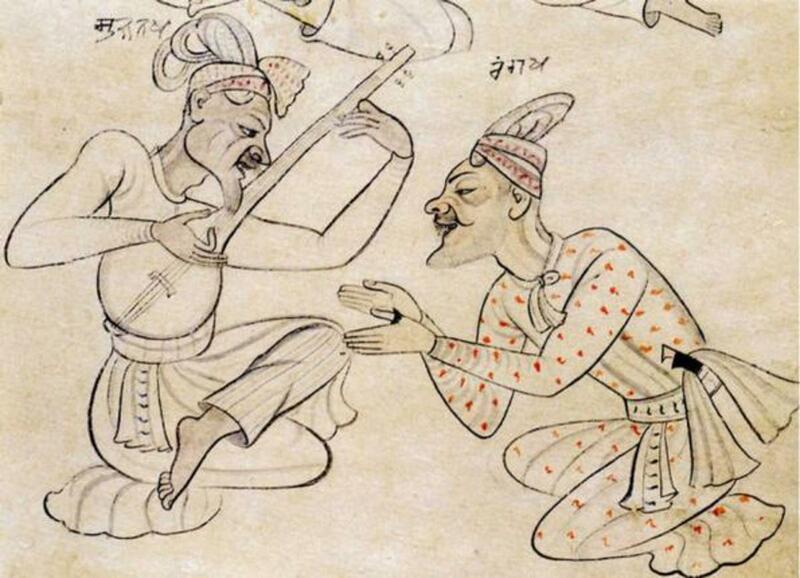 The artists of Pahari paintings had a similar and consistent style. They all followed uniform methods and their techniques were simple and indigenous. The sheets of handmade paper were joined together to get the desired thickness. The outlines were drawn in light reddish brown or grey-black colors and then a very thin and transparent coating was applied on the sketches. Finally, on the white coating, the colors were filled. For brightness, the painting was burnished with boulder or river stone called golla or glass or agate etc. The natural color pigments from mineral and vegetable sources were mixed in water, and gum for binding the paints. 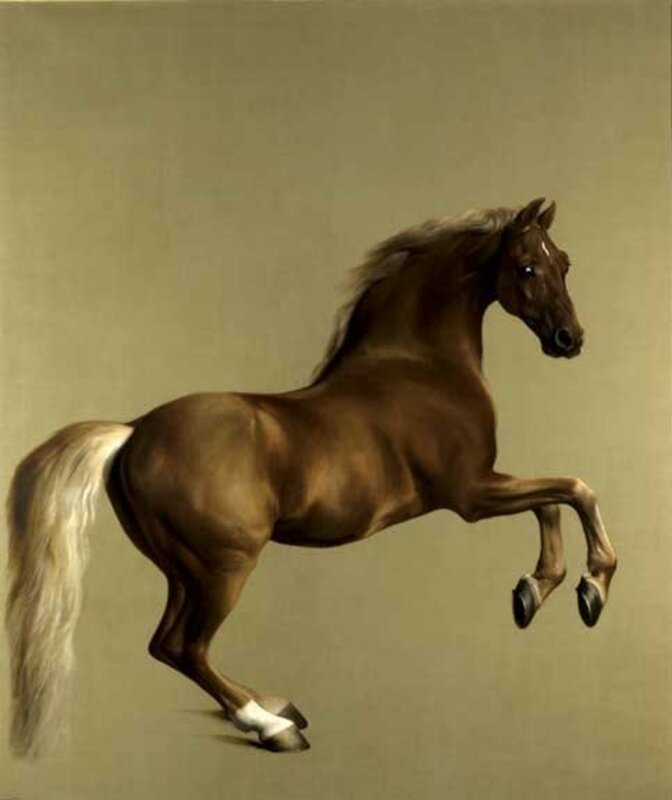 The artists used the brushes generally made of the hair of horse, squirrel, camel etc. and the peacock feather was used as a pencil. The credit to begin the Pahari style of paintings goes to Rajah Kripal Pal (1678-1731), of Basohli, who was the first patron in the region. He was a man of aesthetic tastes with a deep understanding of literature. 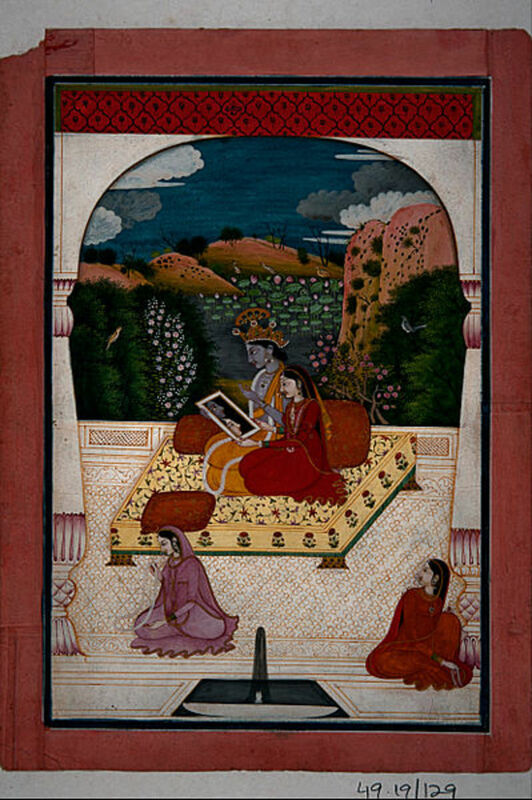 The typical styles of paintings during his patronage have Hindu characteristics as he was a devotee of Lord Vishnu. It was the first Pahari School because no such painting exists before the times of Rajah Kripal Pal. This style influenced on the neighboring states till 1850’s. Unlike Basohli School, the figures and landscapes in Guler and Kangra style are perfect and natural. 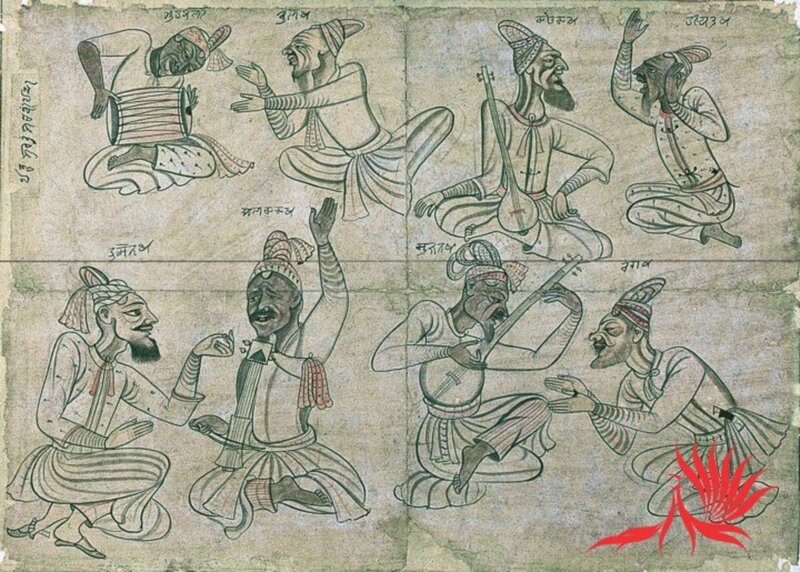 Devidas, a local tarkhan or carpenter of Basholi painted the landmark illustrations of Rasa Manjari series in 1693 during the reign of Kripal Pal. The common theme of Rasa Manjari was based on an epic written by a 16th-century poet Bhanu Dutta. The facial features of well modeled natural figures in the early Basohli paintings have oval shapes, receding foreheads and large passionate eyes resembling the petals of a lotus. These paintings have soft, vivid, harmonious and bold colors. They present the stylized landscapes, circular trees with simple and unique composition. The section and figures of the architecture are often painted separately in the square frame which makes the paintings simple but unique and attractive. Unlike Kangra paintings, this style shows a true understanding of the sense of space. In the 18th century, a host of painters left the Mughal court for Basholi, Mankot, Nurpur and the surrounding hill states. During the siege of Delhi by Nadir Shah, many more artists left Delhi for the hill states. Some of them saw the rulers of Jammu and Kangra as their patrons. Among them was the family of Pundit Seu, whose two sons started their workshops under the patronage of Raja Balwant Singh, the younger brother of Maharaja Ranjit Dev, the then ruler of Jammu. The masterly and expressive works of Nainsukh find a place in Jammu School. He extensively portrayed his patron Rajah Balwant Singh of Jammu in all walks of life. The freedom they enjoyed tempted the artists to create fabulous paintings in the Mughal and Rajput styles being conglomerated into the local traditions. This fusion of local cultures and Mughal styles of paintings produced a glowing new form and style which is now known as Pahari Miniature. There are also some artists who by their own efforts attained great success. They did not acquire this art by family legacy. In the early 18th century, when the Pahari School was in its cradle for its making, then Poonch, a Pahari state in Kashmir had already become well known for its paintings. The popular paintings of this school bear the names of its artists. Since Poonch was ruled by its Muslim lords, the Muslim artists also emerged among the frontrunners. A few paintings of this school bear the name of Jamil Mussavir. Nothing much is known about him and his family, but his paintings show meticulous weaving of portraiture and scenic views. It is almost certain that among many of the artists, who migrated from Delhi and Punjab to the hill states was one named “Seu”. Most of the art critics mention him as a pundit, but according to the documents, he was not a Brahmin but a carpenter. The most authentic source is the Bahi Khata or records of pundit Ram Rakha of Hardwar. It contains the writings of one celebrated artist, NainSukh in Dogri script. He was the younger son of Seu who was a Tarkhan or carpenter and not Seu pundit. Seu died in 1740 AD. From the 1740s until his death, Rajah Balwant Singh (1724-1763) of Jammu was the patron of Nain Sukh. 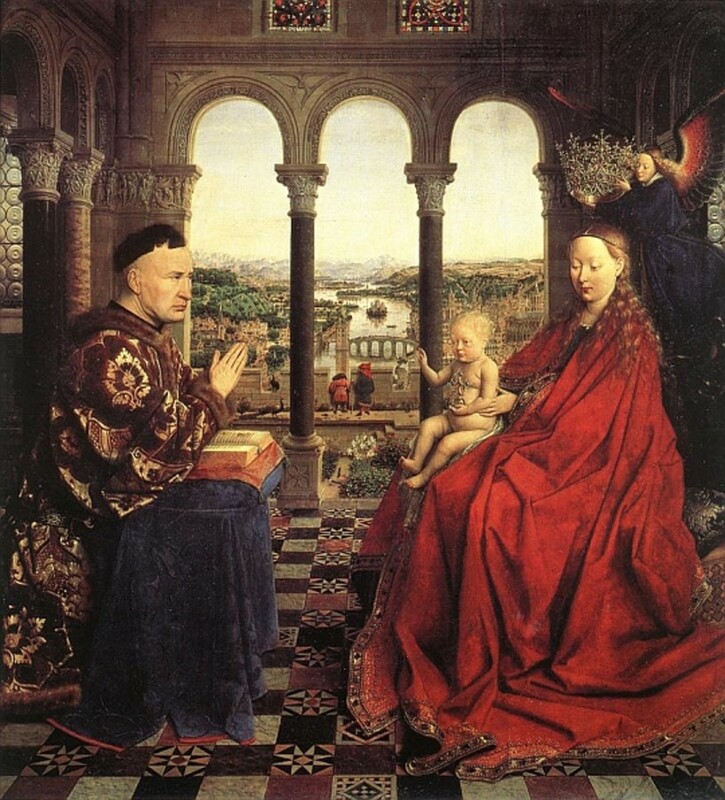 He painted many portraits of the king engaged in different moods and a variety of courtly activities. After the death of Balwant Singh, the famous artist Nain Sukh went to Nurpur with his sons. 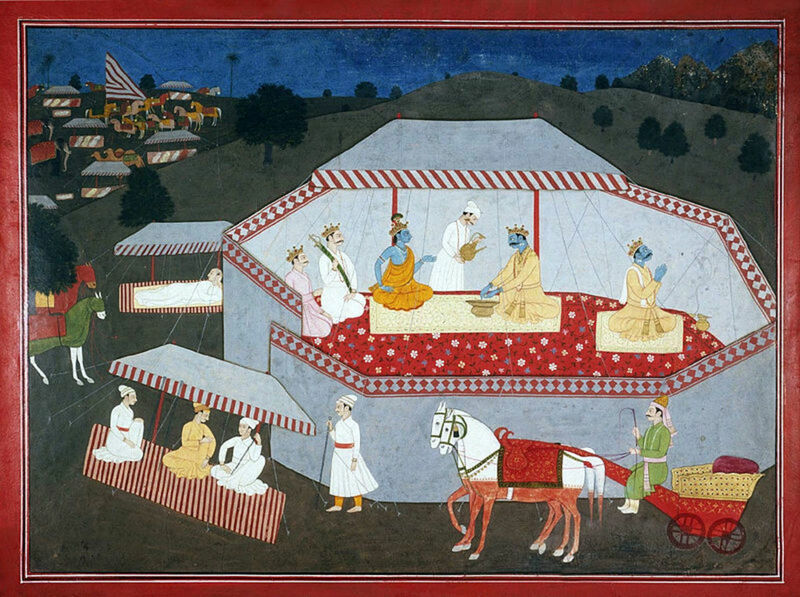 Rajah Govardhan Chand (1743–1773), the ruler of Guler had already established a school of painting at Haripur at that time and he welcomed the painter and his family. Some artists had been working there since the times of his father Dalip Singh. Because of the early rulers of Guler viz. 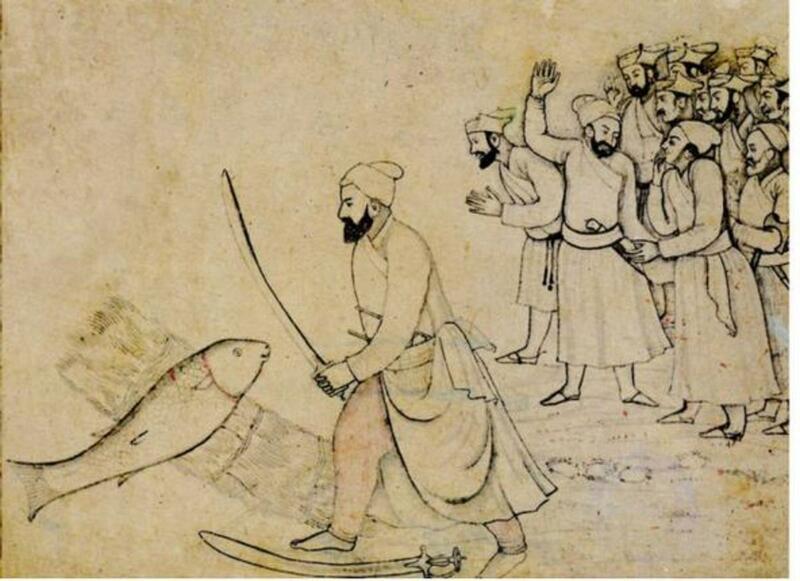 Rup Chand (1610-1635), Bikram Singh (1635-1661) and Dalip Singh (1695-1743), too were having a long tradition of miniature paintings due to their association with the Mughals. But it was Rajah Parkash Chand (1773–1779), the prodigious son of Govardhan who patronized these artists to an extent that he even became bankrupt. 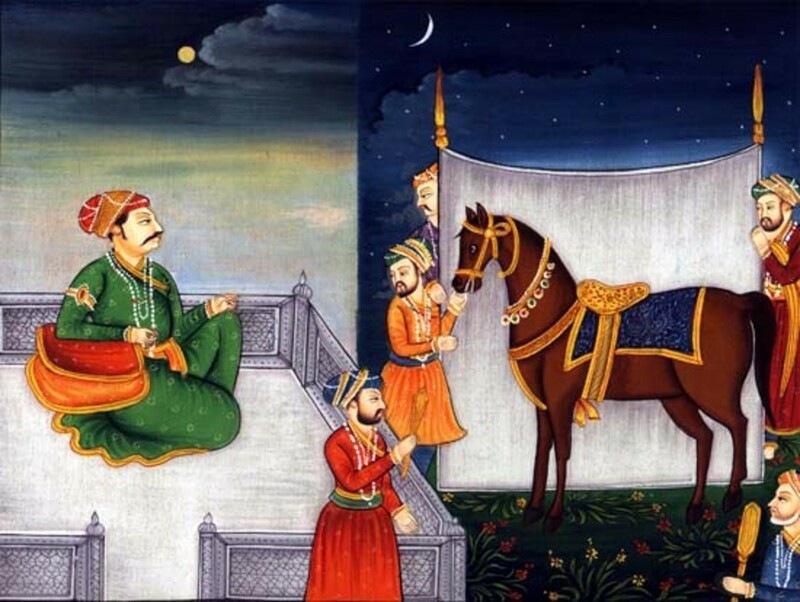 His son Rajah Bhup Chand (1790–1826) continues the family tradition. Nain Sukh got settled in Guler in Vikram Samvat 1820 or 1764 AD, in June or Jyestha. His brother Manku was another artist of Pahari School of paintings. Seu was blessed with two artist sons, Manku and Nain Sukh, who became the two pillars around which the Pahari School flourished. Manku, the elder brother was the master artist of Guler School. 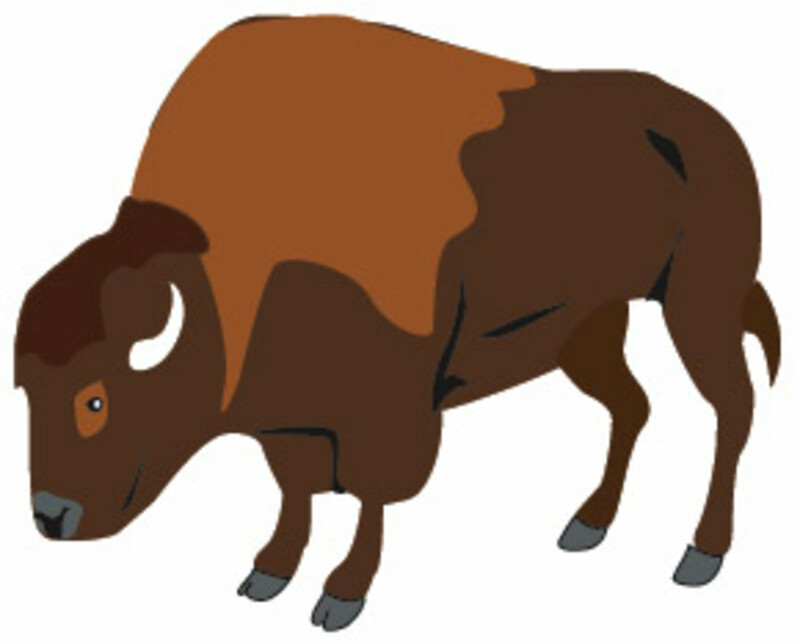 Manku had two sons, Fattu and Kushal who migrated to Kangra. Some of the paintings of this genre owe a lot to these artists. Manku’s grandsons named Madho Malak and Kashi Ram were two artists of repute. 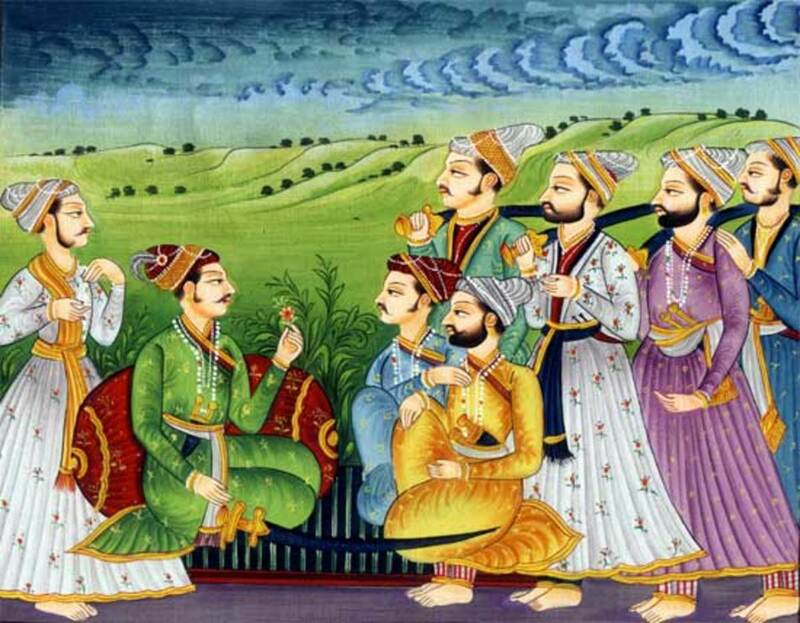 Nain Sukh and his four sons Ranjha, Kamu, Gourhu, and Nikka were also famous for their paintings. Among the sons of Gourhu and Nikka were Sukhanu, Sutanu, Harkhu, Gokul, and Chhaja, who became popular in the durbars or courts of various hill states. Lal Singh the son of Ranjha was patronized by the feudal lords of Pahari states. So the descendants of the family were responsible for the beginning and development of this school. The other descendants were Rajoul, Bhupinder, Parkash and Chandulal Rayana. They possessed a script designed on a paper of Sialkot origin, wherein the figure of the goddess of art in the form of Yogini was drawn. She is shown standing on one leg with her fifteen legs spread in all directions. On each arm is written the name of Pahari state, which indicates the artists were patronized by these states. The states mentioned in these paintings are Guler, Chamba, Kangra. Mandi, Suket, Kehloor, Nadaun, Jaswan, Shiba, Datarpur, Sujanpur, Nurpur and Baskoli, Three names are also mentioned viz. Gurbaksh Singh, Ramgarhia Jassa Singh, and Tej Singh. Surrounded by the hill states of Chamba, Guler, and Mandi, the erstwhile Kangra princely state had maintained its status among the hill states of repute in the past. The very origin of the state can be traced back to Mahabharata when the Kangra king Susharma sided with Kauravas. The fort of Kangra was prominent in medieval times. The great Chinese scholar and traveler Heun Tsang had mentioned in the 7th century that Kangra was a part of Kannauj Kingdom. Two hundred years later it was besieged by the ruler of Kashmir. 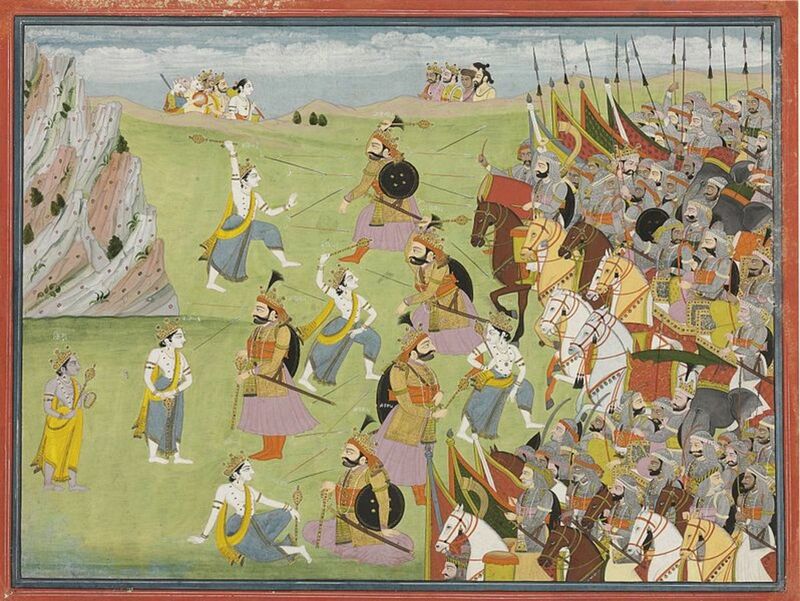 Kangra witnessed the invasion of Mahmud Ghaznavi when he plundered the Indian plains in search of riches. It remained one of the very few hill states rich in beauty and natural resources even after, and attracted the attention of Muslim rulers like Muhammad Tughluq in the 14th century and later the Mughals after 1600 AD. 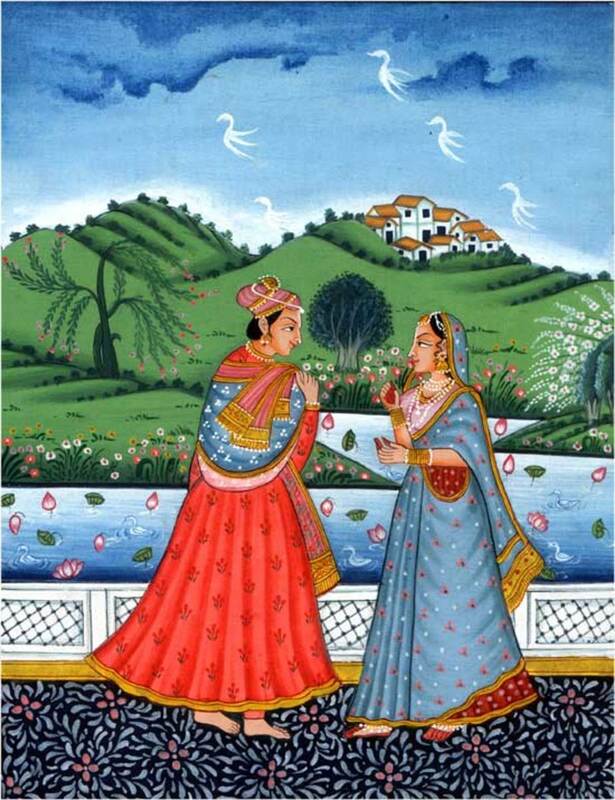 Though the Pahari style of miniature paintings originated in the hill states of Mankot, Jasrota, Basholi and Jammu, yet it flourished only in Kangra. The Kangra style had strong points like the steady brush strokes, selective use of seven colors, pleasing features, well-built beautiful people, different expressions and wide range objects. The use of seven colors is a prominent feature of Kangra School. In 1780 AD, Ranjha, Gourhu and Nikka, the three sons of NainSukh, except the fourth son Kamu, reached the kingdom of Kangra from Guler. At that time the Katoch King Raja Sansar Chand was the ruler. He was a great patron of art and very fond of artistic pursuits. His passion for miniature was never satiated. It was during his reign that the Kangra and Guler Schools flourished. These schools were later adjudged as supreme among all the Pahari styles. It was during his reign that the Kangra and Guler Schools flourished. These schools were later adjudged as supreme among all the Pahari styles. There was another celebrated family of artists, though not of the same stature as that of Seu clan. But this family of artists also made a remarkable contribution to the Kangra School of painting. It was the family of Dhuman or Ghuman. He had two artist sons named Purkhu and Fattu. Among his grandsons were Ruldu and Chandanu, the sons of Purkhu, who were renowned for their works. Other famous artists of Pahari School were Vasia, Padmu and Doukhu. Vasia was one of the most popular artists in the court of Raja Sansar Chand of Kangra state. In 1929, J.C. French visited Kangra, and he discovered four Pahari artists viz. Nandu, Hazari, Gulab Ram and Lachman Das, still working on their paintings. Lachman Das was the great grandson of Vasia, who lived in Samloti during the visit of J.C. French. The ladies in the family were the main inspirations behind the works of the artists. They practiced drawing different facial expressions on the wooden planks for years together and were supervised by the old ladies when the menfolk were generally out of the house attending their jobs in different courts. On coming back they would scrutinize the progress. It was only years later that they were allowed to paint on paper. The caricatures were sketched by the elder artist and the younger ones had to fill in appropriate colors. Afterward, the young artists were allowed to try their imagination on canvas. 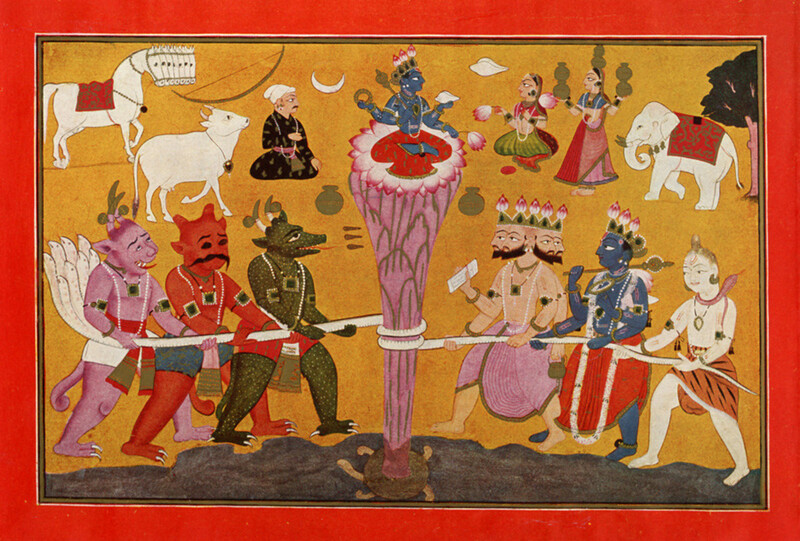 In this school of paintings, Mola Ram emerged as the pioneer, though the names of his forefathers, Shyam Das, Hira Nand and Mangat Ram are also suggested by some art historians, Yet the critics are of the view that they were not the artists of such fine tastes, as to be included in the genre. 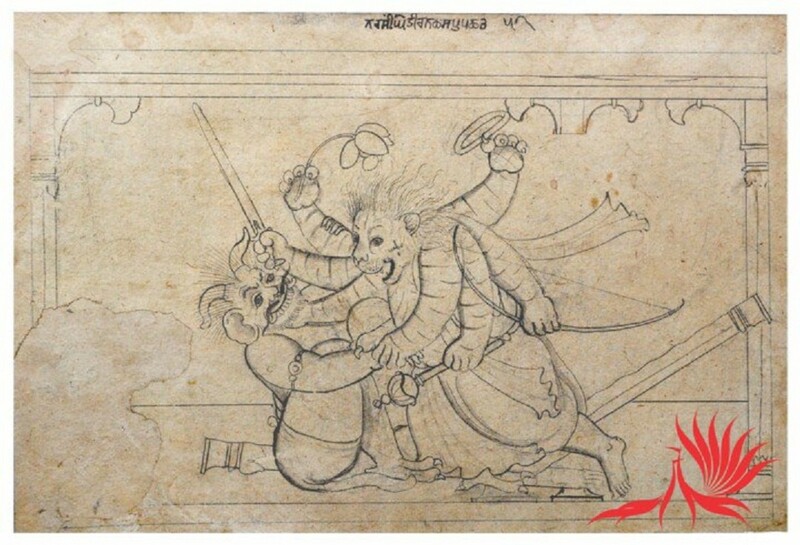 The names of two artists- Manku and Chaitu has been discussed by historians time and again. Still, there is a lot of controversy regarding them. According to many art historians, Manku, more or less the brother of Nain Sukh was the son of Seu, the head of the family of talented artists who migrated to Jammu hills in early 18th century. They believe that Manku migrated to Guler and did several beautiful paintings in this style in the court of Guler ruler. It might have so happened that during the reign of Raja Anirudh Chand his paintings might have reached Garhwal since the royal families of Guler and Kangra were having matrimonial alliances with Garhwal state. 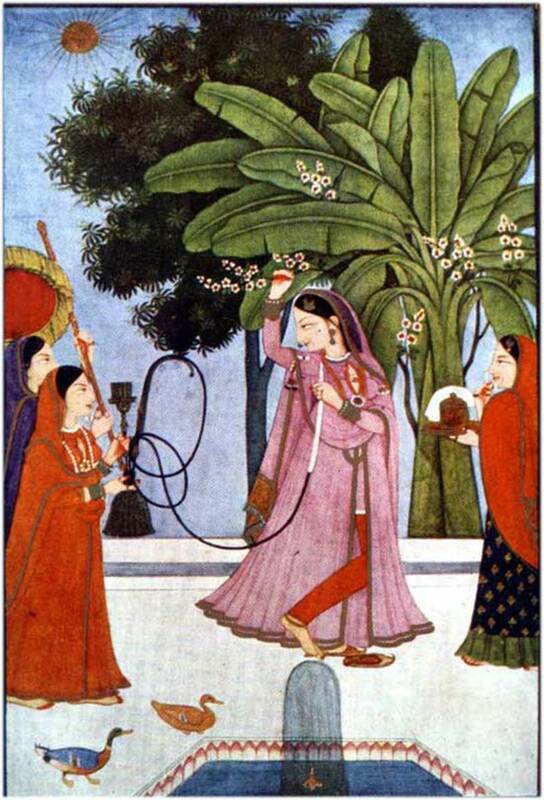 Anirudh Chand of Kangra married his two daughters to Raja Sudarshan Shah of Garhwal and the paintings in Kangra style were also gifted away to the Garhwal ruler. There is another theory that Manku might have gone to Garhwal himself as many people the Kangra state during the reign of Raja Anirudh Chand. It is said that the best works done in Kangra were taken to Garhwal. That is why most of the art historians do not agree with the paintings of Maula Ram. 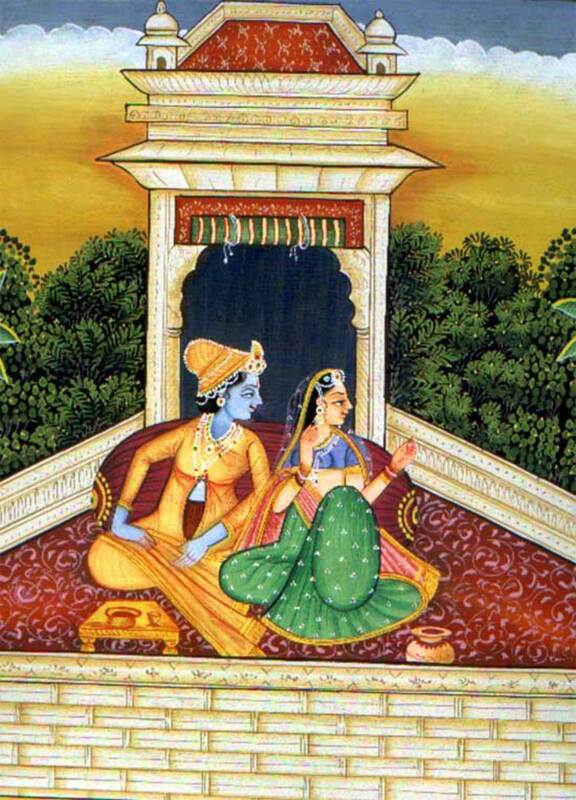 They think that these paintings were originally created in Kangra but afterward falsely credited to Moula Ram. In the same way, the critics think that even Chaitu did not belong to Garhwal, but was a member of Seu family. 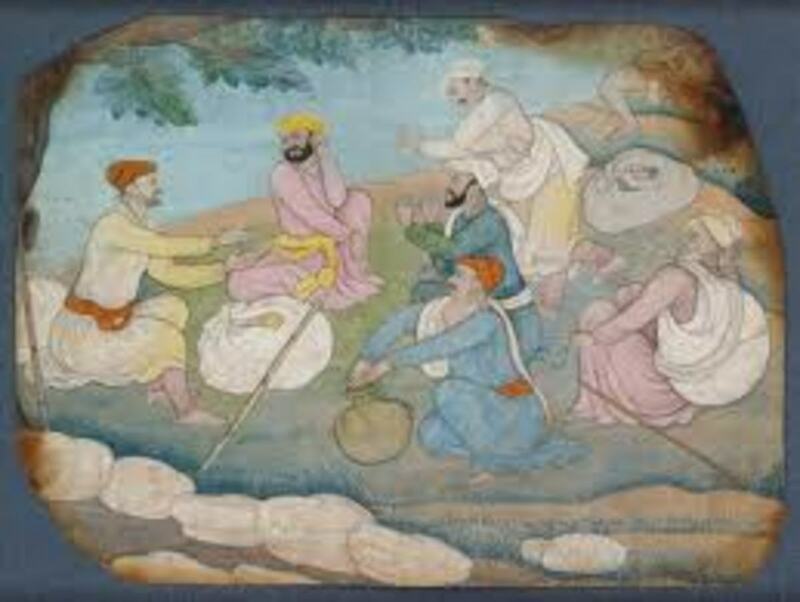 Among the progeny of Moula Ram his son Jwala Ram and other artists like Tulsi Ram, Hari Ram and Balak Ram were also well-known painters. The paintings in Garhwal style, an offshoot of Kangra School generally depicts the leafless trees. Chamba was one of the principal centers of Pahari miniature paintings from 17th century to the beginning of 20th century. A good number of miniature paintings of Basohli style the highest quality involving exquisite workmanship were produced in this period. There is no recorded evidence of Chamba paintings on paper wood or wall before the reign of Rajah Prithi Singh (1641- 1664 AD), of erstwhile state of Chamba. But it could be safely surmised that the paintings in some forms, folk or otherwise must have been done by the local artists before this period. All the Rajahs of Chamba viz. Chatter Singh (1664-1690 AD), Udai Singh (1690- 1720 AD), Ugar Singh (1720- 1735 AD) and Dalel Singh (1735- 1748 AD), were the lovers and patrons of art and maintained ateliers of artists in their courts. 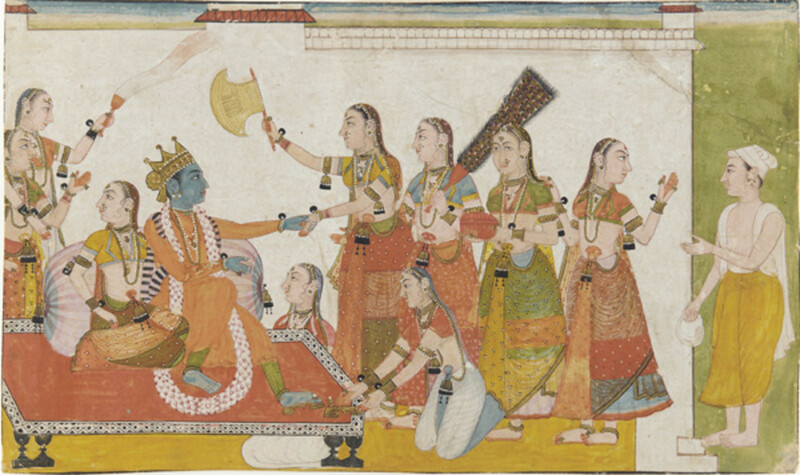 The Chamba paintings were developed during the reign of Umed Singh (1748-1764 AD) and Raj Singh (1764- 1794 AD). The latter was the contemporary of Rajah Sansar Chand of Kangra when the Pahari paintings reached their zenith. It was the golden period of Pahari miniatures. 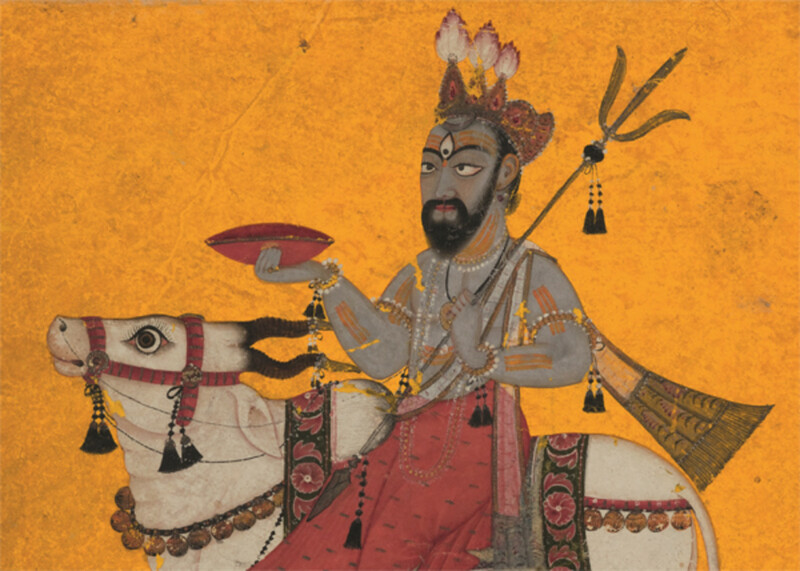 These paintings now adorn the galleries of various museums in India and abroad. 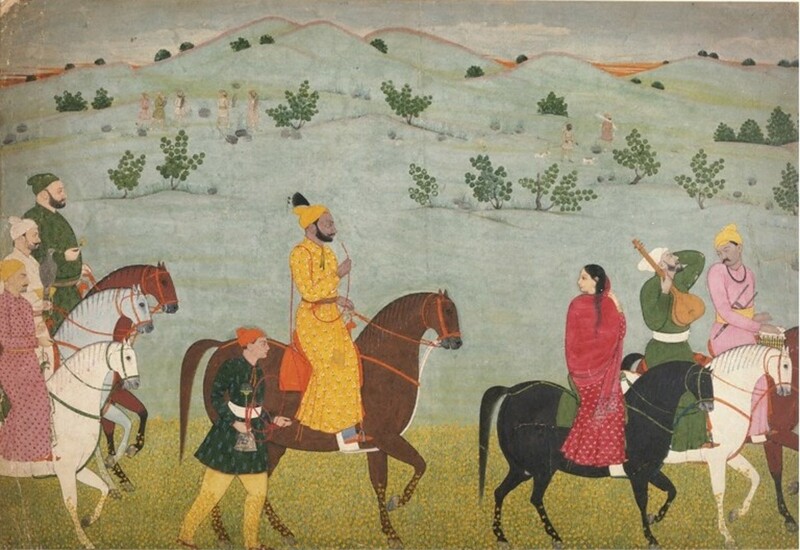 In 1665 AD, Nikka reached Chamba from Guler with Basohli style and painted the picture portraits of Raj Singh and his son Jeet Singh (17p4- 1808 AD). He too patronized the Chamba art as it had become the fashion of the time to imitate the aesthetic tasted of Rajah Sansar Chand. Chadath Singh (1808- 1844 AD) continued giving protection to the paintings and other art forms. 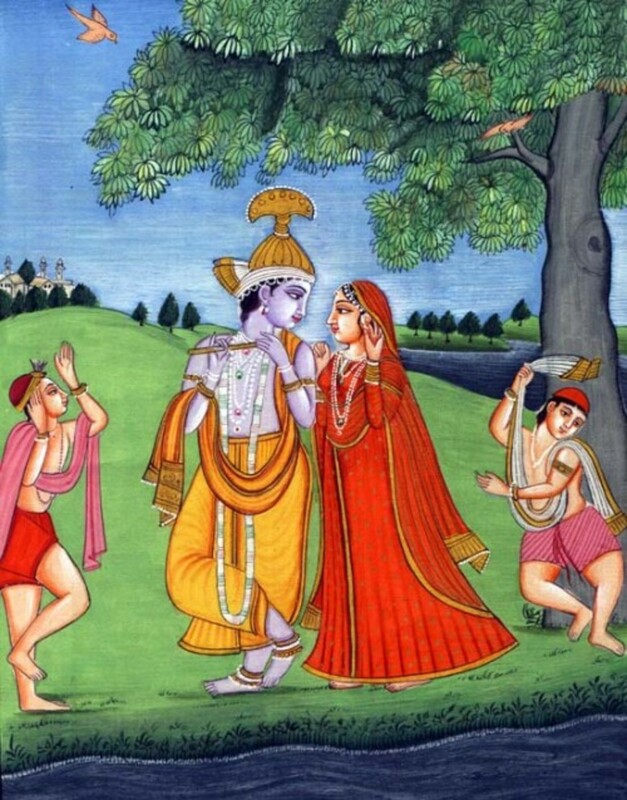 The albums of fine paintings of Hindu myths, legends and religious themes of Ramayana, Bhagwad Puranas, Bara Masa Ragmala Series, Radha- Krishna, Durbar of lord Rama, The Gopis, the love scenes, birds, and women were commissioned and produced in Chamba. Like the Pahari style, there are two types of paintings in Bhuri Singh Museum of Chamba. The portraits consist of the paintings of the rulers of Chamba and the adjoining states, In Chamba portraits, the ruler and his consort are shown with the heir apparent in a homely atmosphere. On the other hand, there are three objectives of the series of mythological paintings. 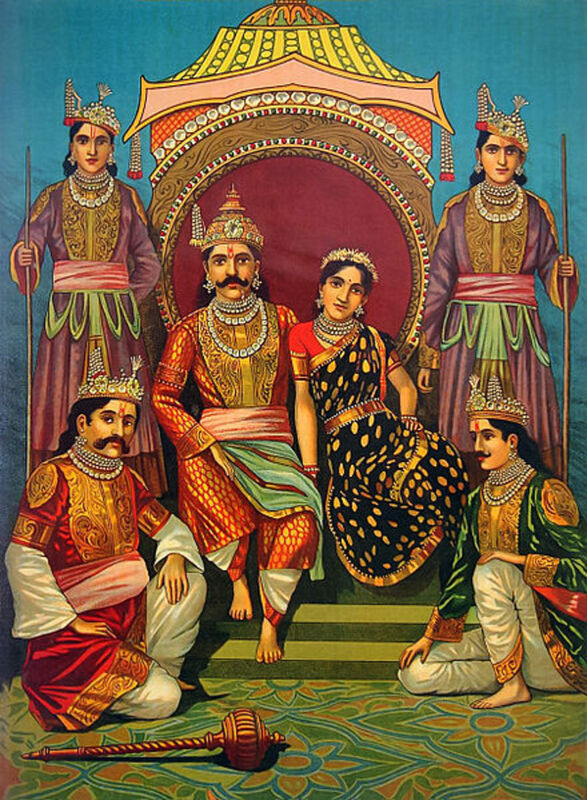 They are Usha- Anirudh, Krishna- Rukmini and Krishna – Sudama. The Mughal influence in paintings and murals of Chamba are clearly visible. 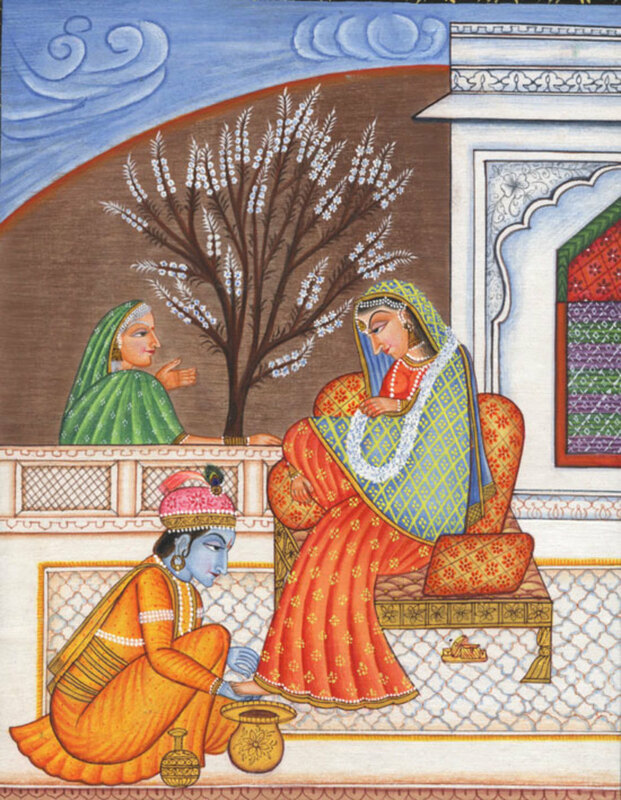 These paintings depict the game of lines, brightness of Basohli colors and extravagant decoration. These minute works show the patience, dedication and painstaking labor of the artists. 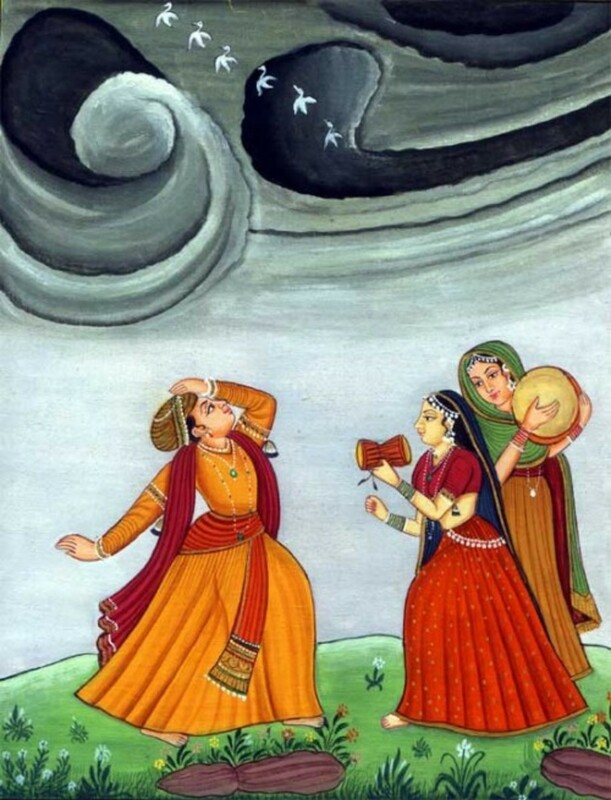 The romance in monsoon season is the favorite subject which has been painted in various moods, styles, and colors. The series of paintings of six episodes or Kaands of Valmiki’s Ramayana adorn the Bhuri Singh Museum. They are the Bal kaand, Ayodhya kaand, Aranya kaand, Kishkinda kand, Sunder kaand and Lanka kaand. Durga Saptshati too has been depicted and a painting related to the birth of Luv-Kush is also there. One painting shows Saint Narada in the court of a king. The Chamba paintings are known for their fineness in naturalism, freshness in colors and delicacy in execution. 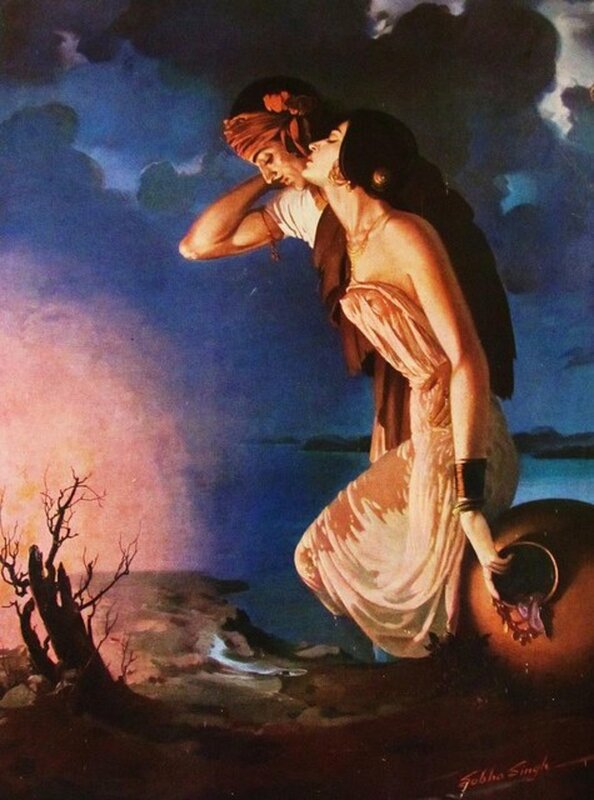 Ranjha was the master artist at the court of Rajah Raj Singh. Other artists whose works are attributed to Chamba School are Nain Sukh, Nikka, Godhu, Ram Lal, Harkhu, Lehru, Durga, Miyan Jara Singh etc. Even the painters from the neighboring hill states viz. Nurpur, Kangra, Guler Kullu, Basholi, Mankot, and Jammu were employed by these Rajas. Some of the painters worked permanently in Chamba, while others used to migrate temporarily during summers. Besides generous patronage, they found solace, peace, tranquility and working atmosphere, which is so essential for an artist to create something unique in the bracing climate of lush green hills of Chamba. Some painters worked for a few months at Chamba as guest artists before and after their yearly pilgrimage to Manimahesh Kailash, the land or abode of lord Shiva situated at an altitude of 13000 feet in Bharmour valley. During Janam Ashtami and Radha Ashtami, the devotees from far flung areas undertake a long and arduous journey on foot to Kailash and return after taking a holy dip in the Dal Lake. There are three families of artists in Chamba town who still possess old sketches, drawings, and rough, incomplete or unfinished copies of paintings done by their forefathers. The members of these families as per their traditions make paintings, bang- dwaries or decorative panels for doors or windows and drawings of marriage ceremonies and other rituals even today. They have opened their studios in the town. Ami Chand Dhiman, his younger brother Hans Raj Dhiman and the grandson of renowned Billu Mistry all work independently to keep the traditions alive. Another young artist Vijay Sharma has excelled in Pahari paintings in general and the Chamba paintings in particular. He has won several awards in various exhibitions and festivals organized in India. He had displayed his work in Himachal Utsav in London, Hamburg, and Frankfurt in Germany. 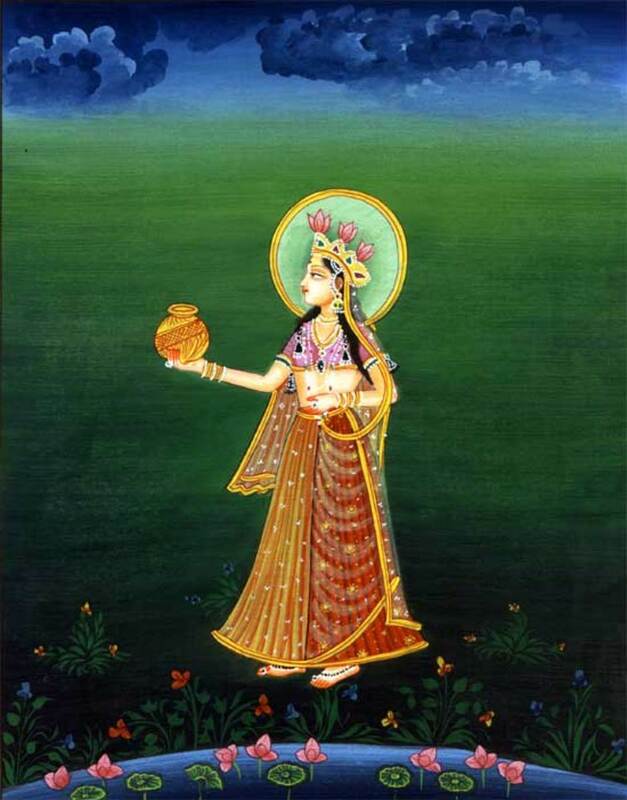 The transparent touch of Kangra paintings has equally overwhelmed the art connoisseurs and critics. Several artists tried to master the lines and colors used in this style. From Guler School, the famous family of Seu and his two sons, Manak and Nainsukh created history in establishing different schools. The elder brother served the hill state of Basholi and created some fantastic series of Geet Govind, Bhagwad Puranas, and Ramayana in addition to several paintings on Ragas and Raginis. Nainsukh went to Jammu, the most powerful hill state in the 18th century, under the powerful reign of Ranjit Dev. Raja Balwant Dev, the feudal lord of Jasrota was a great lover of nature. He patronized Nain Sukh to the extent that he was even permitted to visit the King in privacy. The king wanted his person to be in every painting and even invited Nain Sukh into his harem bedchamber to paint the intimate moments. After the death of the king, Nain Sukh joined his brothers at Basholi. But Nain Sukh’s son Nikka came back to Guler from Jasrota and then went to Rajoul in the taluka or area of Rihlu, which was a part of Chamba state under the reign of Raja Raj Singh. Attra the grandson of Nikka (another son of Nain Sukh), as mentioned in the records of Pandas of Haridwar, also worked in Chamba court. Gokal, the son of Nikka was a rich person by the dint of assets. An anecdote goes that in a conference of about 25 feudal lords of hill states at Mandi, a number of artists came to try their luck. One of them carved an elephant on a tooth and gave it to the lord of Chamba. 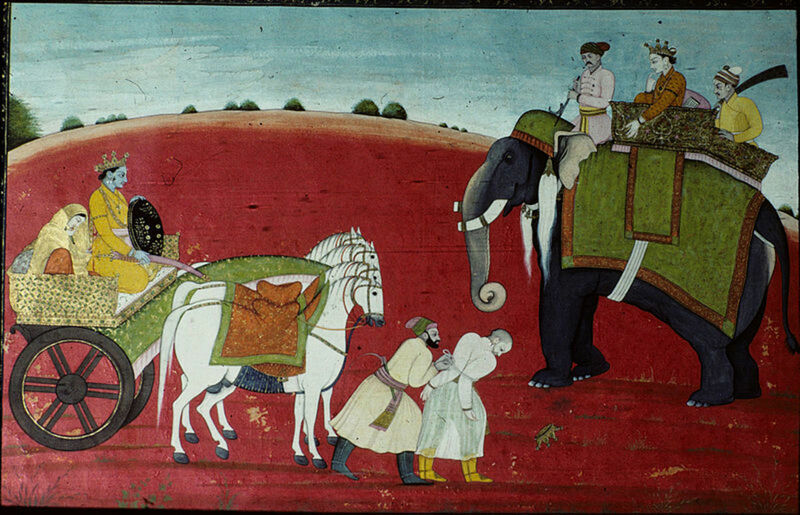 One of the forefathers of Chandu Lal accepted the challenge and painted several elephants on a single grain. Then Manak, the great artist of the times was invited to display his acumen. He asked for a single bundle or than of Dhaka silk or malamal of the length of 100 yards. The silk was a fine threadwork and it was not possible to segregate the threads from one another. Manak began his work and painted a single thread of the entire length of the cloth without touching his brush to any other thread. This feat was much acclaimed and applauded. The lords collectively gifted him a large sum of cash. At present Chandu Lal, the son of Lachman Das and grandson of Gokul is the only member of the family, who has adopted the family tradition of painting and is trying hard to revive the art. After the fall of the feudal system, he adopted this art and has created some beautiful paintings. His painting of Durga and 10 Sikh Gurus won him acclaim. from the art critics. He has created thousands of paintings in this style and several one-man shows were organized by different galleries and institutions to highlight the art pieces. There atmosphere and outlook in the paintings have Mughal architecture and building design, with well decorated and furnished drawing rooms. 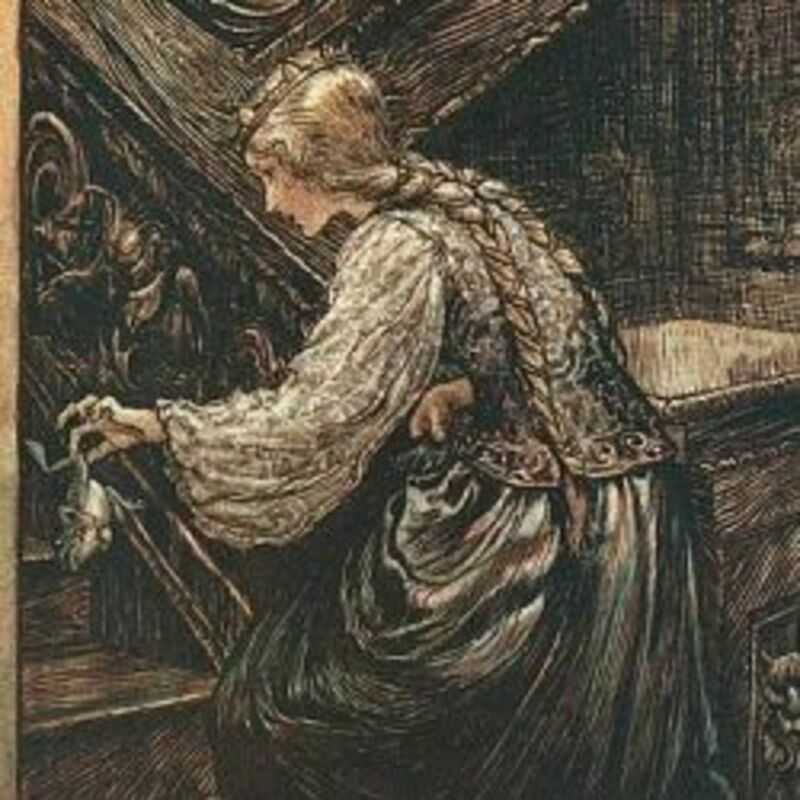 To distinguish the royalty from the commoners, the dress, visage and facial expressions are used as probable tools. The female characters wear jewelry, while the males wear necklaces, earrings, and armbands. The men wear colorful turbans and caps according to their social status. 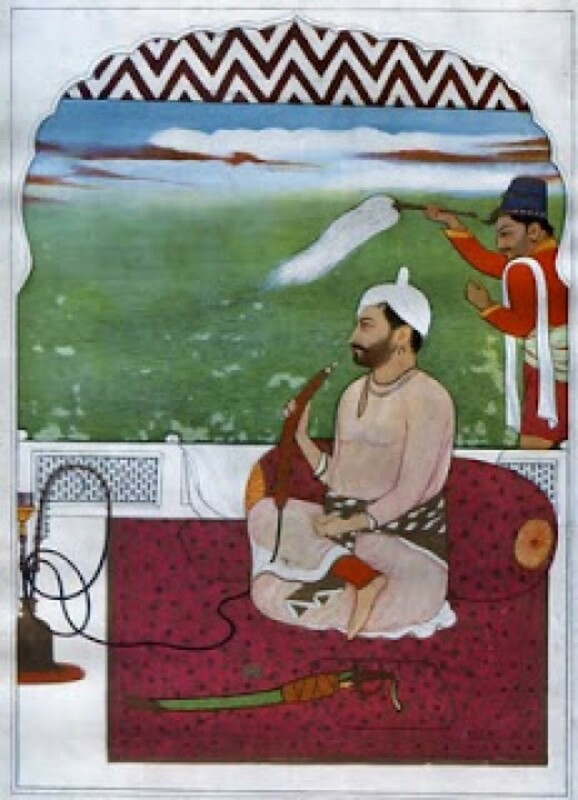 The great ruler of Kangra, Maharajah Sansar Chand (1765–1823 AD) was a patron of art and literature. He was fond of paintings, but it would have been still better had he directed the artists more rigorously. He had a number of artists in his court, who could draw and paint in detail, but they lacked in the division of spaces. 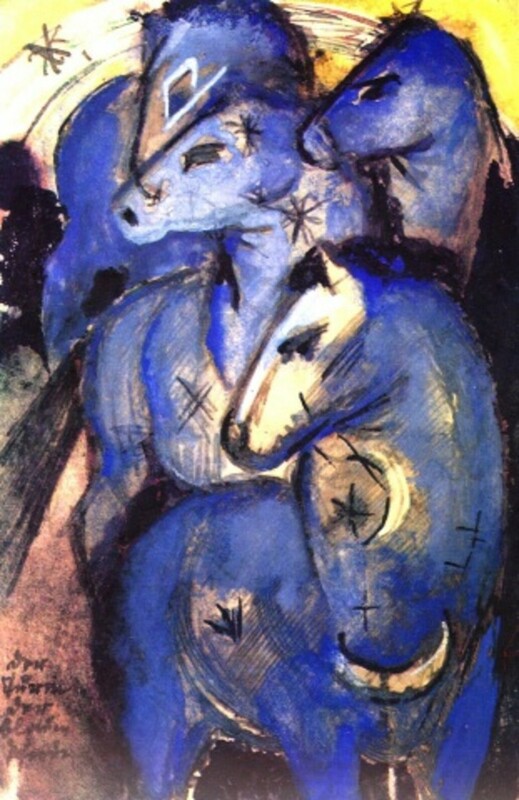 The observation by a reputed art critic indicates that as far as paintings and drawings were concerned, the artists were quite deft, but lacked the knowledge of division and creative use of spaces. The facial features of hill people, royalty as well as commoners are painted against the backdrop of Mughal and Rajput tapestries. Of course one can see the obscure presence of snow here and there, but the unbalanced effect and unnatural depiction of animals irk the beholder. It is strange that artists could paint the human figures with minutest details, but they could not paint the cattle with the same skill. The fleecy caricatures of cows and calves resemble more like wolves. The upper structure of their body is more obscure and fat than the limbs, which are very small and thin. There is no balance between the two. The objects are not of proportionate sizes. Despite these shortcomings, the enchanting Pahari paintings, especially of Kangra, still attract the scholars, art connoisseurs and the artists alike. These paintings find a respectable and prominent place in the famous museums and art galleries of the world. Another flaw in these paintings is the complete observance of hill atmosphere. Hills are popular for their natural beauty, snow clad peaks and natural forests containing waterfalls and swift streams. Yet all these elements are missing. One presumes that the artist did not discard the Mughal sensibilities but merely transform them on new canvases. The art of miniature paintings which brought name and fame for the state and the country from all over the world is dying due to the apathetic attitude of the government. It is still not too late to start a school of paintings employing local artists, who have the technical know-how, skills, techniques, indigenous colors and handmade papers. Thanks, Kunwar Jaideep Singh Chandel for the visit and the comment. Thanks santosh mallik for the visit and liking the hub. Thanks arti for the visit and the comment. Thanks Sarah for the visit and the comment. lots of thanks ! from persia! Thanks mylindaelliott for the visit and the comment. Very interesting and beautiful work. I enjoyed your hub.